or any other reasons you can download the newest version standlone offline flash player installer form the official adobe website. 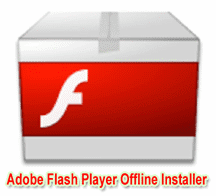 One you get the offline flash player installer, save it and install whenever you want. Three versions are officially available for offline download. Download is link at bottom of the post. Hi Alex Cruz.Mexico.. I too don’t understand why they are providing this secretly…. Hi Asmawati…You are most welcome… thanks for commenting on my blog..
Can This Program Work To Y8.com Games ?? I understand that I have to install flashplayer offline, but every link (including your own)I follow in order to download the offline installer, does not want to open at all. This is especially so with macromedia.com. I’m desperate!! Also, do you maybe know how to disable the touchpad on a Lenovo 2.0 laptop? Thank you very much, it’s very irritating the way companies hid the full installer! Can anybody tell how to install Adobe flash player version 11, 1 many thnx for android phone. please let me to Share this Article at my forum.